On some very rare occasions, a product that arrives in my Cuisine Cube is actually something I am familiar with…or…perhaps…even might have tried before. When it comes to the Non-GMO Project cube, which arrived in October, I was actually surprised to encounter a brand that I had already tried. Albeit, this was not a flavor I had tried from this brand, but it is readily available at my local Whole Foods! Like I said…this doesn’t happen often…but sometimes it’s a comfort to find a small brand that you have familiarized yourself with before. This product…was the Gluten Free Chocolate Chip Granola from Jessica’s Natural Foods. Jessica’s Natural Foods was started by Jessica Mindell, an avid baker with a background in engineering. Back in 2009, her husband discovered that he was gluten-intolerant and said that he missed oat-based granola. Once Mindell was able to find gluten-free oats and a certified gluten-free facility, she was able to launch her healthy, delicious granola. Since then, her bags of granola have expanded to over 25 states. Mindell’s passion for natural foods means that she always bakes with simple, pure ingredients and keeps health and nutrition at the forefront of her products. Prior to this Cuisine Cube…I had picked up a pack of the Jessica’s Natural Foods Gluten-Free Pecan Almond Granola. My Cuisine Cube stepped it up a notch by including one of my most favorite things…chocolate! Chocolate chips to be exact. With all the time that I’ve spent traveling and racing these past couple of months…and the holidays taking over life in general…I haven’t had much time to explore some items from some of my Cuisine Cubes. That being said, I’m making a push currently to polish off most of the products that have made a home in my pantry. I need to be more pro-active about these products…and that’s not a bad thing. It is definitely getting me to branch out and try some things I had been content to let sit for awhile. Yep…the sweet-tooth, chocaholic emerged with a vengeance upon seeing that in the name. WIN! That morning, I darted out to the grocery store to pick up a few necessities that were needed for the coming week and ended up picking up a big container of Greek yogurt, some fresh organic blueberries, and a few other fruits and vegetables to use for the various meals I needed for the week. Breakfast…lunch…dinner. You name it. But, I hadn’t made many of my fruit & yogurt breakfast parfaits for a long while, and I knew this was a delicious and nutritious way to start the morning. With some granola at home, it was just a matter of choosing the fruit. I had thought to get strawberries, but the organic ones didn’t look too good. We are, after all, out of season. But, the blueberries looked big and ripe and therefore…came home with me. That morning, I assembled two breakfast parfaits, making use of the Jessica’s Natural Foods Gluten Free Chocolate Chip Granola, vanilla Greek yogurt, local honey, and the fresh organic blueberries. I just layer these up and top it off with more granola and…voila…breakfast was served. Jessica’s Natural Foods gluten Free Chocolate Chip Granola is, without a doubt, one of the best granola’s I have had since going gluten-free. The gluten-free oats were toasted and golden to perfection. Adding to the sweetness were the melt-in-your-mouth bits of semi-sweet chocolate chips. It feels like you’re cheating, but in reality, you are eating something that is good for you. Mixing these delightful spoonfuls with a thick and delicious Greek yogurt and bursts of fresh fruit juice from the little blueberries…this made a perfect breakfast with each bite. The granola brought this fantastic and light texture to the entire dish. And, if left with a bag of this and no supervision, I could easily eat the entire bag in one sitting. The clusters with the chocolate were my favorite part as they would melt upon hitting my tongue. This made handfuls of this granola a great treat…if not addictive. Seriously…one of the best parts of any breakfast I have ever eaten in my entire life…this granola is amazing. And I don’t feel bad indulging in it, because the ingredients are natural and the nutritional information is rather good! Granola can become a calorie-laden sugar-fest, so it’s always good to take a look at ingredients and nutritional information. For Jessica’s Natural Foods Gluten Free Chocolate Chip Granola…this is what the company strives for. The Gluten-Free Chocolate Chip Granola is made from certified gluten-free rolled oats, semi-sweet chocolate chips, organic honey, brown sugar, expeller pressed sunflower oil, ground flax seed, coconut, maple syrup, pure vanilla extract, cinnamon, sea salt, tocopherols (natural vitamin E). This granola is free of cholesterol and trans fats. It is also gluten-free and non-GMO. 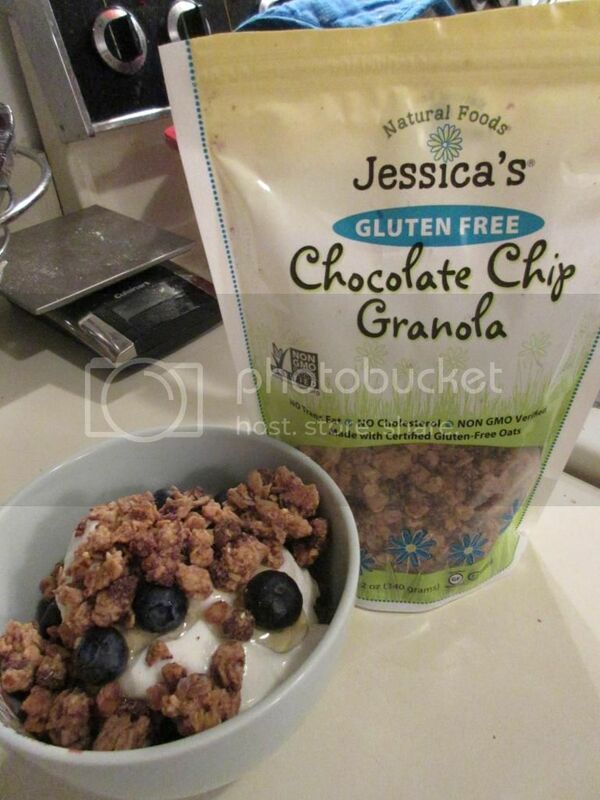 A serving of Jessica’s Natural Foods Gluten Free Chocolate Chip Granola is 1/4 cup. Trust me…this may not seem like much…but it is an amazing and filling 1/4 cup. Mmm…chocolate by the quarter-cup. In this serving, you will be consuming 130 calories and 6 grams of fat. Not bad for granola. Not at all. In this serving, you will also be taking in 30 mg sodium and only 7 grams of sugar. Yes…only 7 grams. That’s amazing. So often, the gluten-free granola I find is laden with heavy sugar. Not these. Naturally sweet more than anything. And finally, this 1/4 cup serving gives you 2 grams of fiber and 2 grams of protein. Not too filling, but filling enough, especially when paired with nutrient dense Greek yogurt and fiber-filled fresh fruit. Oh yes…it’s a rare thing when Cuisine Cube sends me something I am already familiar with, but in a way, it’s also quite satisfying. If you have yet to join the happy consumers of Cuisine Cube…just go over to their Web site and check out your options. Every month is like Christmas as you open up your box and discover what products have been selected for you. These monthly deliveries start at $29.99…and are so totally worth the investment. I have yet to regret making this choice to enjoy these monthly deliveries. Seriously…give it a month and you will want to keep going! It’s because of this service that I am able to try foods like Jessica’s Natural Foods, a less-processed and lesser-known product than some of the brand name gluten-free granola out on the market. I much prefer to support the smaller businesses who put a lot more thought and care into their products and the making of their products. I feel that way about Jessica’s Natural Foods…so check them out too! If you can’t find these bags of granola goodness at your Whole Foods…get online and place an order! Stop hesitating…and just do it! This entry was posted in Baked Goods, Breakfast, Chocolate, Clean Eating, Cuisine Cube, Dessert, Food, Fruit, Gluten-Free, Granola, Oatmeal, Products, Review, Snacks, Sweet Stuff, Vegetarian, Yogurt by The Celiathlete. Bookmark the permalink.